You've heard of putting oatmeal into smoothies for thicker, creamier texture. It works with quinoa, too! Try it in these luscious strawberry shakes. Combine water, drink mix and sugar; pour half into blender. Add half each of the quinoa, strawberries and ice; blend until smooth. Pour into 1-gal. pitcher. 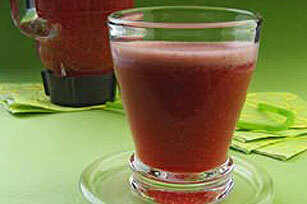 Prepare using your favorite fruit and KOOL-AID Unsweetened Drink Mix flavor.